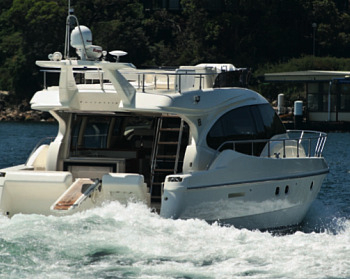 The Italian Ferretti 470 motor yacht feels right at home on Australian waters. Ferretti’s high standard of finish is evident throughout the boat. The 470 is simple, comfortable and elegant and the low-key design suits the current mood in the city. The sofas’ corners are tapered to make the most of the available space. Putting the radar arch off the back of the bridge gives the 470 a sleek, swept-back look and the helm station makes manoeuvring the 14.65m hull almost effortless. Brigitte Bardot had one. So did Richard Burton. And now an Australian family have joined the ranks of Ferretti owners. On a hot, hazy day in late November, we stepped aboard the first Ferretti 470 to arrive in Australia. The yacht was docked at Jones Bay wharf in Pyrmont, in Sydney’s inner Harbour, and the urban backdrop suited such an urbane yacht. The 470 is now the famous Italian marque’s entry-level model, having superseded the 460. Ferretti built almost 80 of the latter and is hoping to emulate that success with the 470. The company’s marketing material says that the 470, launched at the Genoa boat show this year, “reinterprets” the 460—a euphemism, I think, for re-targeting. Everything about the 470 points towards the buyer that Ferretti has in mind: the young and privileged. Yet for a young millionaire’s boat (you’ll need $1.49 million to buy this one), it lacks ostentation. It actually feels like a boat. The galley, for instance, has not marble tops but quartz-resin and teak counters; Instead of a vast screen dominating the saloon, there’s a smallish TV perched discreetly on a sideboard. There’s not a gold leaf in sight. Clearly, Ferretti have gauged the cultural mood, and with the witch-hunt going on over executive bonuses, have decided that ostentation is out and low-key is in. The design is the result of collaboration between Ferretti’s in-house engineering division and Italian yacht-design heavyweight Studio Zuccon International Project. The collaboration’s most immediately noticeable fruit is the light. The design may be low-key, but one thing the designers have given the boat in abundance is light. I have never been on a 460, but the reps from JW Marine assured me the 470 has substantially more window space than its predecessor. When I stepped from the stern deck into the saloon, I didn’t get the feeling of entering a giant cocoon, which is what many motor yachts feel like. On the 470, natural light streams down through the raked windshield, in through the side windows, and of course through the back, where the sliding doors open up to create an uninterrupted living area. It was a hazy day on Sydney Harbour, but we didn’t need to turn on any of the boat’s interior lights. Another clue that Ferretti have the young in mind with this boat is the position of the galley—it’s at the back of the saloon, and its benchtop gives onto the aft deck, so whoever’s cooking can serve directly to family or friends lounging by the water. Australian builders have been putting the galley at the back for some time, but it’s less common on luxury yachts built in Europe, since European buyers of this kind of boat tend to be older and more likely to have staff. Australians even privileged ones, and especially young ones tend to cook for themselves. They’ll feel at home on the 470. The saloon is simple, comfortable and elegant. The designers stuck to a subdued palette of light cream, gold teak, and chocolate highlights. There’s no gloss nothing gleams on the 470 apart from the stainless fittings. They really did resist ostentation. The result is a sense of space, which actually matches the real space. I guesstimated at least 10 adults could sit comfortably on the sofas, and the designers cleverly tapered the corners near the thoroughfare so that no-one will bang their shins walking from the helm station back to the galley or aft deck. The teak coffee table in front of the sofas turns into a dining table for six thanks to a hidden electric motor. All you have to do is unfold the table’s top leaves, then press a button and the whole thing lifts to dining-table height. Step forward past the helm station, down a small but steep flight of stairs, and you come to a sort of atrium, with doors leading from it to the forward stateroom and back to two guest cabins. The atrium itself is worth noting. It’s directly beneath the raked windscreen, so you have blue sky above you. I stood there a moment and imagined how nice it would feel to emerge from the stateroom or one of the cabins (which, unavoidably, get a lot less light than elsewhere on the boat) into the morning light here after a night’s sleep at anchor somewhere. The Whitsundays, say. Or Tahiti. Back to the boat. I’m not saying there’s no light at all in the cabins just less of it. Like most boats of this type, the stateroom has long, narrow windows on both sides and a hatch above the bed. It has more window space than the 460, I was told. I said above that the position of the galley and the subdued palette give this boat an Australian feel, and that’s true. When I stepped into the stateroom’s ensuite, however, I saw irrefutable evidence of the 470’s European-ness: a bidet. It comes standard, and of course you can order a 470 without one, though obviously the new owners preferred to keep theirs. There’s another touch of old Europe at the helm station: a cigarette lighter. The guest cabins are simple and elegant, and the single beds long enough so that someone of my height (188cm) can sleep without his feet sticking out the end or, worse, banging them against a bulkhead. But I wasn’t here to sleep. Back at the helm station, I watched the JW Marine rep expertly and effortlessly used the bowthrusters to edge away from the dock. You can run this boat with two people, and even then one of them won’t have a whole lot to do once he’s unmoored the lines. Sitting high in the helm station seat, with 360° visibility, you can control this 14.65m (LOA) boat almost like a toy. The 470 comes standard with a Raymarine C120 Widescreen multifunction navigation unit, as well as autopilot. The Melbourne owner requested an additional screen, which is smart, since he won’t have to toggle between functions or reduce the size of the display with split-screen. Electro-hydraulic power steering, electronic throttle-control functions such as easy-dock and auto-troll, and a full Raymarine suite of navigation electronics simplify the helmsman’s life to the point that you could easily forget you are driving a 22.8t (laden) motor yacht. Two 600hp, Cummins QSC 8.3 engines give the 470 a cruising speed of 28 knots and maximum of 31 knots. The tank carries 1600 litres of fuel, which, at cruising speed, give the 470 a range of around 200 nautical miles. We spent the test day within Sydney Harbour taking photos, mostly within no-wash zones, so I never got to feel the 470 hitting her 31 knots. We did do some big turns at speed, however. Once on the plane, the bow lifted a bit until the helmsman trimmed her down, and despite the chop, the hull gave little bounce. A very comfortable ride, albeit on a benign sea. Ferretti supplies a 3.5kW generator as standard, but JW Marine packages the boat for the Australian climate with air-conditioning, bow-thruster and a 9kW generator to power them. I was surprised to learn that Ferretti offers air-conditioning as an option. The Med is certainly cooler than most Australian waters, but it still has its stifling days, particularly off the coast of southern Spain. In any case, importers JW Marine rightly consider it a necessity. Having said that, we didn’t run the A/C on the test day, despite the heat. Instead, we had the aft door slid all the way open. The windows are tinted and it was comfortably cool inside the saloon. I didn’t feel the heat ’til after we had anchored west of Bradleys Head, near the Taronga Zoo ferry wharf, and I had climbed the external stairs to the flybridge. The midday sun was beating down, and if I had been not an overdressed, heavyset journalist but Brigitte Bardot, or even Richard Burton for that matter, I would have sprawled across the vast sunpad at the back of the flybridge and worked on my tan. Instead, I sat on its edge, sweated in my chinos and made notes. Ferretti has put the radar arch off the back of the flydeck, not over it. That was a great design move. It means there’s nothing but sky above you when you’re on the flydeck—good for your tanlines—and it gives the boat a much sleeker, swept-back look. A “sporty silhouette”, as Ferretti puts it in its marketing material. Now, some of you might worry that the radome is too low and microwave radiation will fry your brains—a high price to pay for a shadowless flybridge and a sleek silhouette. You have to remember, however, that skippers tend to switch on the radar only in weather or at night, not in the middle of a sunny day with perfect visibility. And who drives from the flybridge in the rain or at night ? The instrument panel on the flybridge helm station pops out of its cavity at the touch of a button. There’s a smallish dining table (larger families will want a bigger one), a bar fridge and room for a barbecue. There’s a bimini, too, though in my view it’s redundant. Those who want to sit in the shade need only step down to the main deck. The flybridge is for sunlovers. There’s a storage space under the stern that can be converted into a crew cabin (for a crew of one). Ferretti will build it if you ask for it. I doubt they’ll build many, however: navigating the 470 is easy enough, and living aboard it is even easier. The Ferretti 470 is a luxury motor yacht where the ‘luxury’ part is subtly presented and the ‘motor yacht’ part is emphasised. There’s really no need for staff or crew.